Welcome to the American Express® Corporate Card Programme and to MyPA. This unique website provides you with a wealth of information and helpful assistance for you to fulfill your role of Program Administrator within your Company. In fact, we'd like you to think of this website as your very own Personal Assistant. As Program Administrator, you play a vital role in the day-to-day operation of your Company's Corporate Card Programme. You are the central point of contact for program management, and play a valuable role in assisting your colleagues when they require information and direction regarding their American Express Corporate Card. MyPA has been specifically designed for you as a comprehensive resource, providing you with all the information and answers you will need for smooth program management. With MyPA as your own Personal Assistant, you can rest assured that the program administration of your Account will be efficient and effective. So take a look around, and on behalf of American Express, we would like to thank you for the valuable role you play in your American Express Corporate Card Programme. The American Express Corporate Card Programme is designed for companies whose turnover is greater than Rs. 5 crore per annum. A sophisticated Expense Management Solution, it is specially designed to meet the needs of major companies and multinational organisations. The program offers significant benefits including increased visibility and control, exclusive savings, and benefits for your employees. Not only can the American Express Corporate Card Programme add value and deliver substantial savings to your Company, it can effectively streamline your day-to-day business expense management processes and procedures. This helps you to reduce costs while increasing visibility and control. Specifically designed to help manage your Company's travel, entertainment and general business expenses, your American Express Corporate Card Programme also offers a range of benefits, savings and discounts that recognise and reward your Company and your employees. Visit Cardmember Benefits and Company Benefits for a summary of the great value the American Express Corporate Card Programme can deliver to your Company. The American Express Corporate Card Programme offers a variety of configurations to meet your Company's needs. Your Company's unique configuration was established when you first set up your Account. This section explains the various aspects of Account Configuration. You are required to nominate contacts from your Company to be the liaison points with American Express and to fulfil tasks required to manage your Company's Account. These contacts were established when your American Express Corporate Card application form was completed. The roles of these contacts are outlined below. Usually has the title of Financial Controller, Chief Financial Officer, Managing Director, Partner, Accounts Payable Manager or General Manager. The Authorised Signatory may also be referred to as the Decision Maker. Program maintenance including Cardmember changes and reporting. American Express Corporate Gold Card. The Corporate Green Card offers a substantial array of benefits and insurance cover, and is designed to meet the needs of the majority of employees in a company. To enrol new Cardmembers, click here. The Corporate Gold Card offers additional insurance cover and prestige. It is typically provided to senior members of a company in recognition of their additional requirements and position within your organisation. Annual Cardmember fees are applied on a sliding scale according to the number of Cardmembers in your Company. This means that you may be able to achieve cost savings by adding Cards to your Account. Annual Fee per Card in Rs. Annual Fee per Gold Card in Rs. The type of liability set up on your Account will determine who is responsible for charges on the American Express Corporate Card. Further information on each option is outlined below. Your Company is liable for all charges incurred by a Cardmember who has resigned or whose employment has been terminated until American Express has been notified and requested to cancel the Cardmember's Corporate Card. For further information about this option, please click here for the Limited Liability – Corporate Account Agreement and Set-Up form. Joint & Several liability, means that the Company and the Cardmembers are jointly and severally liable for all Charges on the Corporate Card. For further information about this option, please click here for the Joint & Several Liability – Corporate Account Agreement and Set-up Form. Reduces the number of reimbursement cheques written. Allows Cardmembers to put personal expenditure on their Card if this is permitted under company policy. 1. The centrally billed option is only available to existing customers who are set up with this billing option. Offers the company the opportunity to review the statements but without the administrative workload required to reconcile and pay monthly bills. Cardmembers can enrol for Online Monthly Statements. Monthly statements are only delivered online for individually billed accounts. An email and a message will be sent each month informing Cardmembers that their statements are ready to view. Cardmembers must select Online Statements by logging in or registering at Manage Your Card Account and selecting Paperless Statement delivery. On the basis of a global limit. This is a spend limit or control that you can apply at any level of your hierarchy. This enables you to set different controls based on your Company's internal policies and procedures. This includes the opportunity to apply individual spend limits to each Cardmember so you can control either their monthly spend or limit the size of each transaction. Corporate Card hierarchy is the name given to the structure or operational framework of the Corporate Card Account. The hierarchy always includes Corporate IDs (CID) or Control Accounts. 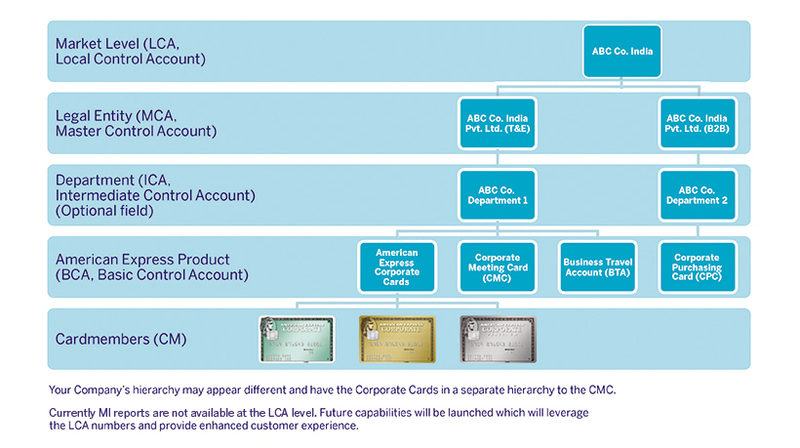 Basic Control Account number (BCA) – each individual Corporate Card sits within the BCA. Click here to return to the Account Configuration menu. If you have recently joined the American Express Corporate Card Programme, the information below provides you with details on the implementation process of your Account. If you are simply adding Cards to an existing Account, then the process begins with American Express processing the individual Cardmember applications. Web Site Rules & Regulations | Trademarks | Privacy Statement Copyright © 2019 Users of this site agree to be bound by the terms of the American Express Web Site Rules and Regulations. Gurgaon – 122002, India.Incorporated in the USA.